These dangle earrings are made of flattened 935 Argentium Sterling Silver wire, and hand-fabricated 935 Argentium Silver Filigree wire. 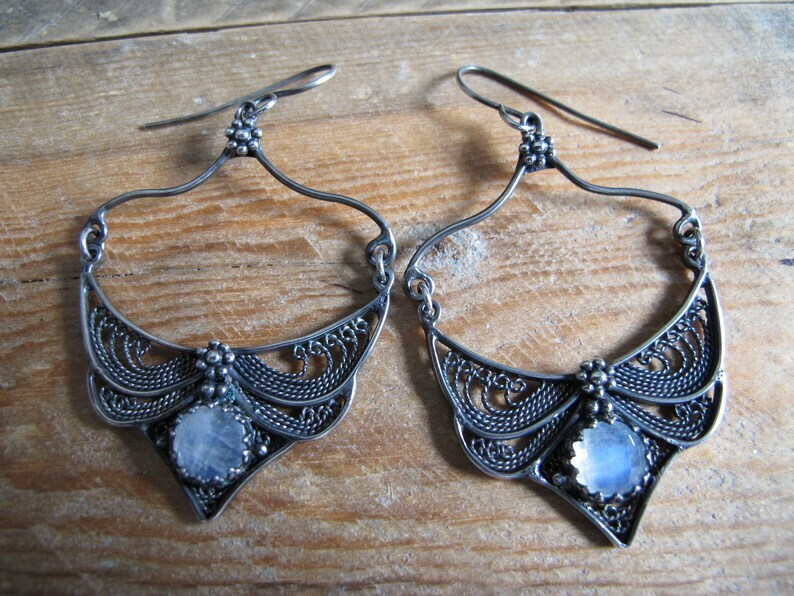 I antiqued the silver to a rich blue black and made the ear wires out of 935 Argentium Sterling Silver. These earrings are also embellished with faceted Rainbow Moonstone cabochons that reflect beautiful blue light. The earrings measure 2.5 inches long including their ear wires, and 1.5 inches wide. Each wire was lovingly designed, flattened, twisted, bent, soldered and polished by me.